For thousands of years, walnut trees have been cultivated and have varying origins. For example, the English walnut originated in India and the regions that surround the Caspian Sea. 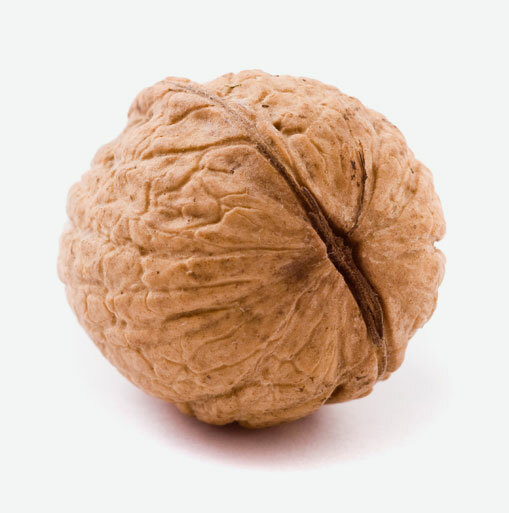 It is now known as the “Persian” walnut. Around the 4th century AD, Romans introduced walnuts to many European countries where walnut trees have been cultivated ever since. Throughout history, the walnut tree has been highly valued. Walnluts are used for food, medicine, shelter, dye and lamp oil. Walnut kernels consist of two bumpy lobes that look like intangible butterflies. The lobes are off white in colour and sheltered by a thin, light brown skin. They are partially attached to each other. The walnut kernels are enclosed in round or oblong shells that are brown in colour and very hard. Three main types of walnuts that are consumed are the Persian walnut, the Black walnut and the White walnut. The Persian walnut is the most popular. The black walnut has a thicker shell and is harder to crack. It has a pungent taste. The White walnut has a sweeter and oilier taste than the other two types and is difficult to find in the marketplace. The health benefits that walnuts provide make it an easy nut to crack. Walnuts are delicious and provide an excellent source of omega-3 essential fatty acids. Omega-3 EFA is a special kind of protective fat that the body cannot manufacture. Just a 1/4 cup of walnuts provides the body with about 90% of the daily recommended value for these essential fats. Walnuts are heart protective, they act as an anti-inflammatory for arthritis and skin diseases such as eczema and psoriasis. When buying whole walnuts that are in their shell, choose ones that feel heavy for their size. Look for shells that are not cracked, pierced or stained as this could be a sign of mold development on the walnut meat which causes the walnuts to be unsafe for consumption. Due to their high polyunsaturated fat content, walnuts should be stored in an airtight container and placed in the refrigerator where they will keep for up to one month. You can also place them in the freezer where they will keep up to three months. Sprinkle walnuts into plain yogurt and drizzle with some maple syrup. Add walnuts to baked goods and toss some into breakfast cereals. Add these delicious nuts into pureed sweet potatoes and in your favourite poultry stuffing. Add walnuts to salads or eat them as a snack with an apple. Roasted walnuts are delicious and easy to make. Simply pre-heat the oven to about 160 to 170 F. Spread walnuts on a cookie sheet and roast in oven for about 15 to 20 minutes. Cool the walnuts and enjoy. You can also make your own granola. Mix together about 1/2 cup of honey, 2 tablespoons of blackstrap molasses, dash of sea salt and a teaspoon of cinnamon or ginger. Place 6 cups of rolled oats in a large bowl and toss to coat with the honey and molasses mixture. Spread this on a cookie sheet and bake at 275 F for about 45 minutes. Cool this mixture and toss 1/2 cup of roasted walnuts, one cup of your favourite dried berries and enjoy the granola.